A-HOTEL.com - Luxury and cheap accommodation in Oravská Lesná, Slovakia. Prices and hotel, apartment booking in Oravská Lesná and surrounding. This indicative offer was derived from the most recently booked accommodation in Oravská Lesná and sort by the price, from cheapest Oravská Lesná accommodation to the most expensive hotels. To select accommodation by your preferences we recommend to choose from 4 accommodation offers in Oravská Lesná in total. By entering the dates of your overnight stay in Oravská Lesná and using the filter tools you can sort the best possible accommodation for you. The entered dates of your stay are crucial for the most accurate offer as it derives all the online information on pricing and availability of Oravská Lesná accommodation. 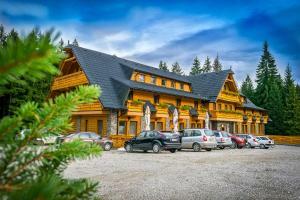 Then you can book the selected Oravská Lesná lodging (hotels, apartments etc.) immediately. Featuring ski-to-door access, Zrubová Chata Sylvester offers accommodation in Oravská Lesná with free WiFi and mountain views. Guests staying at this chalet have access to a terrace. Located in Oravská Lesná in the Žilinský kraj region, Chata Vločka has a terrace. Guests staying at this chalet have access to a fully equipped kitchen. Located in Oravská Lesná, Penzión Severka offers a terrace. Among the various facilities of this property are a shared lounge and ski storage space. Situated directly at the Orava Snow Ski Area and set in the Oravská Lesná, Penzión Kohútik offers accommodation in rooms, a restaurant, a bar, a games, room a terrace, a 24-hour front desk and a garden with barbecue facilities. Free WiFi is available in all areas and free private parking is possible on site. Surrounded by the nature in the village of Novoť, Stará Izba offers a self-catered accommodation set 20 km from the Oravska Water Dam and Namestovo town. The Polish border is reachable within 4 km. Hotel Havrania features free access to the wellness area, free WiFi and a TV in all units. A free tennis court, a gazebo and a restaurant with an extensive wine list are available. Set in Hruštín, Horský Hotel Kristína features free WiFi. Boasting a 24-hour front desk, this property also provides guests with a restaurant. Set in Hruštín, Koliba u Kuba a rekreačné domy provides accommodation with free WiFi and flat-screen TV. A continental breakfast is served each morning at the property. Penzion Solisko is set in the popular skiing village of Zazriva in the Orava Region. Featuring free Wi-Fi and free parking, it offers a restaurant. Located in Zázrivá in the Žilinský kraj region, Three-Bedroom Holiday Home in Zazriva is a 3-star property boasting free WiFi. The holiday home has mountain views and is 45 km from Martin. Holiday home Zázrivá is located in Zázrivá. Guests staying at this holiday home have access to a fully equipped kitchen. Holiday home Zazriva IV is situated in Zázrivá. Guests staying at this holiday home have access to a fully equipped kitchen. Holiday home Zazriva is located in Zázrivá. Guests staying at this holiday home have access to a fully equipped kitchen. Boasting a garden and a shared lounge, Chata u strýka Joža provides accommodation in Terchová with free WiFi and mountain views. The property is 12 km from Vratna Free Time Zone. Surrounded by the Malá Fatra National Park and situated in the picturesque village of Terchova, Chata Sipkova I offers a self-catered accommodation, a garden with barbecue facilities and a terrace. Free WiFi is available in all areas and free private parking is possible on site. Featuring a garden with free barbecue facilities, as well as a children’s playground, Chata Sipkova II offers self-catering accommodation in Terchová. Free WiFi access and free private parking are provided on site. Located on the outskirts of Zázrivá, 1 km from the Zazriva-Kozinec Ski Area, Penzión Slnečný dvor offers a restaurant, a garden with barbecue facilities and a children’s playground on site. Buffet breakfast is served every morning. In the heart of Mala Fatra National Park, Apartmány Božka is a small settlement of Vyšní Repáňovia, 7 km from Vratna Freetime Zone Ski Area. It features self-catered accommodation with satellite TV. Located in the Mala Fatra National Park, Janosikov Dvor consists of traditional Slovak cottages, mainly with wooden furniture. It offers free Wi-Fi in the restaurant, free parking and a sauna. Dom w Beskidach provides self-catering accommodation in natural and peaceful surroundings of Żywiec Landscape Park. Guests have use of the garden and free public parking on site.